An exotic bug is found invading parts of southern California and Arizona. It is referred to as painted bug in some literature and is similar to the harlequin bug, Murgantia histrionic in appearance. But it is called Bagrada bug, Bagrada hilaris (Burmeister) and belongs to the stink bug family Pentatomidae of the order Hemiptera. Origin and distribution: It is native to Africa and is reported to infest and/or cause crop damage in parts of Asia and Europe. It is an exotic pest in the US. 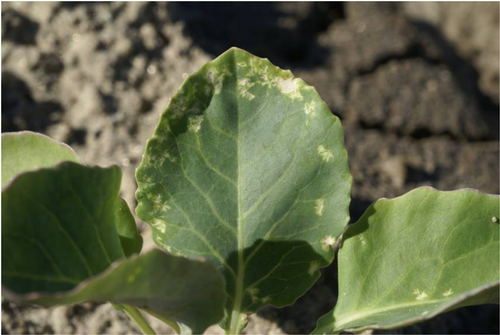 It was first reported in Los Angeles in June, 2008 and started causing damage to broccoli, cabbage, cauliflower, kale, radish, rutabaga, collards and other crops by the next year. It is now seen in Orange, Imeperial and Riverside Counties of California and all over Yuma Co in Arizona. Host range: Feeds mainly on crucifers like cole crops, but can infest a variety of other hosts including solanaceous plants like potato, malvaceous plants like okra and cotton, leguminoseous plants like legumes, cucurbits like cantaloupes and watermelons, and graminaceous plants like wheat, corn and millets. Biology: Adults are 5-7 mm long and 3-4 mm wide. They are black with orange and white markings. Females are larger than males and lay an average of 95 barrel shaped whitish eggs in clusters on foliage or in the soil. Eggs turn orange as they mature in 3-6 days. Nymphs resemble ladybugs due to their dark head and thorax and reddish or orange abdomen with white or black markings. They go through five instars before adults emerge in 5-8 weeks depending on the temperature. They have multiple generations in a year. Damage: Bagrada bugs have piercing and sucking mouthparts and feed on the plant juices. Depending on the crop and plant part they infest, damage can vary from stippling with necrotic spots, stunted growth, loss of apical dominance and formation of multiple heads to death. Management: Reports indicate that Bagrada bug can be controlled with pyrethroids, organophosphates like chlorpyrifos and malathion and neonicotinoids like imidacloprid in conventional fields using different treatment methods. Neem products have also showed some effectiveness in a study conducted abroad. Biological and microbial control options are being evaluated by some researchers. What to do: It has not been reported in vegetable growing California Central Coast or areas other than those mentioned above. 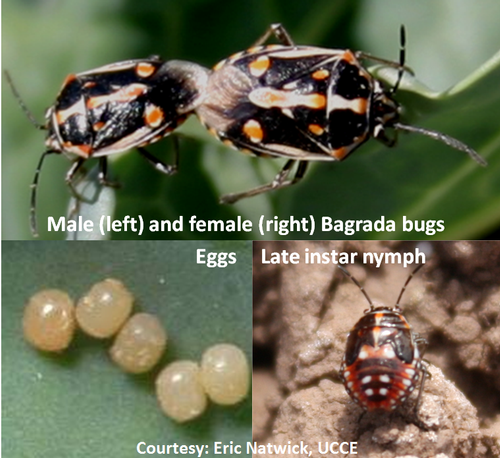 Since they are already found on several cole crops in the neighboring counties, those in Ventura, Santa Barbara, San Luis Obispo Counties or surrounding areas should keep an eye out for this bug. It is important to be aware of this new pest and report its occurrence. If you find it in a new area, please call (805-788-2321) or email (skdara@ucdavis.edu) me. Ahuja, B., R. K. Kalyan., U. R. Ahuja, S. K. Singh, M. M. Sundria and A. Dhandapani. 2008. 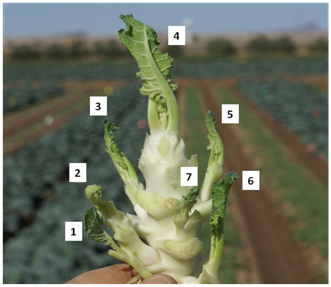 Integrated management strategy for painted bug, Bagrada hilaris (Burm.) inflicting injury at seedling stage of mustard (Brassica juncea) in arid western Rajasthan. Pesticide Res. J. 20: 48-51. Halbert, S. E. and J. E. Eger. 2010. Bagrada bug (Bagrada hilaris) (Hemiptera: Pentatomidae) an exotic pest of cruciferae established in the Western USA. Florida Dept of Agriculture and Consumer Services, DACS-P-01750.